In the mid 1990s barely anyone had heard of Porth Ysgo outside a select few climbers and a few holiday makers touring the north west tip of wales. 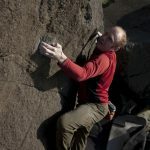 It is believed that Al Harris and his friends including Jim Perrin ‘discovered’ and relished in the climbing possibilities at the place in the 1970s. 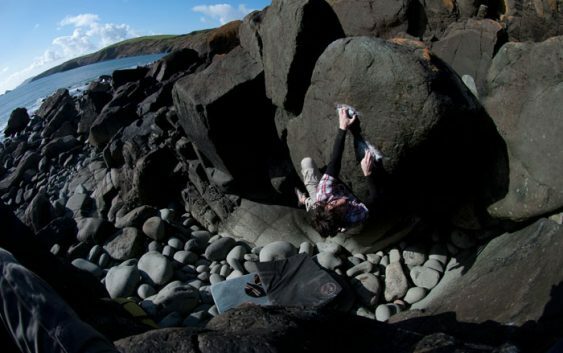 Yet it was still relatively unheard until the birth of the welsh bouldering scene in the late 1990s, when those who went there found a bountiful boulder filled paradise. 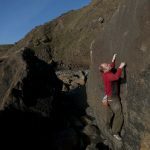 Why Porth Ysgo took so long to become popular probably comes down to the development and the widespread acceptance of both bouldering and more importantly the crash pad. 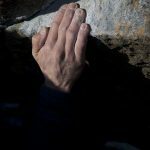 So as long as bouldering was seen as some inferior version of the great game of climbing and as yet excepted into the broad church that is climbing, a place like Ysgo was of little value to climbers. 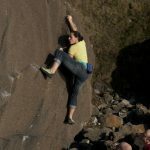 More than that though before pads existed and indeed even still armed with several of them climbers still find some of the landings and highball nature of Porth Ysgo boulders somewhat alarming. It is the heart in month element that only adds to the feel of the places, giving it more of a soul and allowing the brave to flourish. Situated on the end of the Lleyn Peninsular, below the village of Rhiw. This place is guarded not by a wall or mot but a maze of narrow lanes. Despite having been there numerous times, I still wonder whether will I ever get there and back the same way. Its location though is the making of the place, as whilst it can be raining all the way from Llanberis to pretty much Abersoch, those few extra miles can make all the difference, as rain seemingly passes the place by with little interest, like it forgot it was actually a part of Wales. Even on the rare occasion it does rain, the rock dries reasonably quickly, especially if there is a sea breeze blowing. The final carrot is the rock. Some say it is Gabbro, other that it is in fact a type of Dolerite. I once thought that the rock had been transported down in the ice sheets from that famous Gabbro on Skye. However geological maps show there are a few seems of micro-gabbro nearby and a much more likely source. I will let the geology student argue over pendants with their masters, as all you really need to know is that the rock is amazing to climb. The bullet hard rock, is either black and smooth in places and others cast almost golden by lichen on some of the coarses rock this side of the pennines. The first time you go there the place will enchant you, as whilst there are only a few lines there that are world class in difficulty there are so many problems that are world class at there grade that most moderate climbers are well catered for. More than that the often tranquil setting of a wave washed boulder beach will have you dreaming of going back no sooner than you have left. 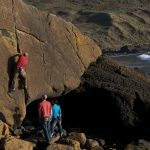 The discerning climber will want to do the full tour of the place on first acquaintance but be under no illusion though this is a full on day and whilst you will no doubt come away happy. You will have almost as many open accounts as closed ones. In the process you will get to know the whole promenade. As you approach from the car park, and descend through a small grass valley along which a stream trickles. Further down signs of it being mined are apparent as the rock is rich in Maganese. And the valley opens out and you arrive at the edge of the sea you need to head straight down the hillside to the sea, this brings you out at the western end of the bouldering and the start of our little tour de force. Whilst there are several nice problems in the most western area for me the fun starts around the the Ysgo Flange V2, with Truth V1 from a stand up start offering another fine warm up. If you are good then the contortionist sit-down start to Truth V8 and the various strength sappingToys… problems V5/6 are also excellent starters. 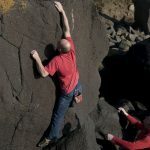 There are several other good warm up problems from V0 to V3 in this area, all of which will set you up for the Higginson Scar a superb and technical V4 that is the first real introduction to the higher top outs and poor landings. The next section blends into the last and you get another selection of great filler problems like Joystick V2 and Grooverider V0. 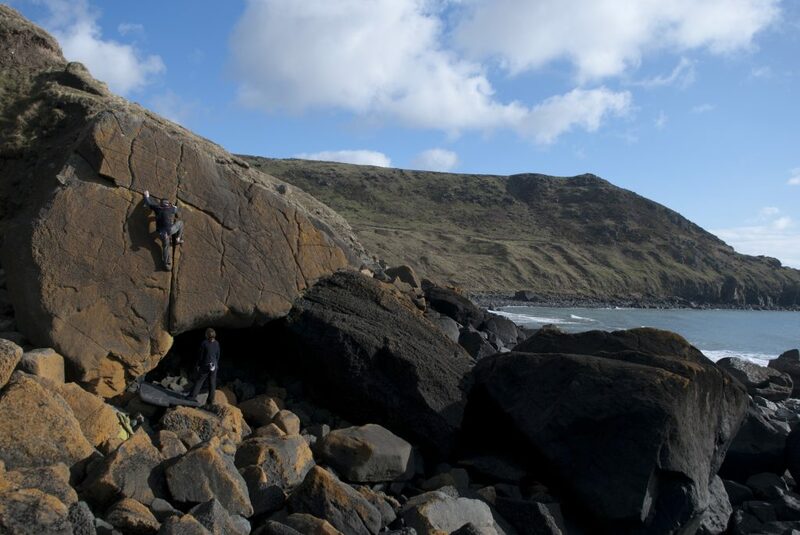 Then down to the Black Krispy boulder with a host of problems from V0 to V6. The main even though is the Incredible Shaking Man Block. The Incredible Shaking Man is a tricky V3 from a stand up, with a frustrating slap for a sloper that will grate your fingers like a mandolin and rather desperate V7 from a sitter, which will do the same but more aggressively. It’s neighbour Perrin’s Crack V2, and most other problems on this block have top outs that feel like grit micro routes given the horrific landings in places. Another couple of don’t miss routes are Uncle Pete’s Arete V1 or Beach Boys Arete V4. Whilst there are more quality problems nearby on the Van Guff block and the Ysgo Flake V3, most people will up and move camp from here over to the base of The Ramp which gives a good position to observe people as they depart of the Ysgo Crack, which is more HVS route than boulder problem, although if you can get off the ground and into the crack then the rest is easy. Other problems are Here comes the Sun V2 and the memorable slopey top out/mantel of Foam Party V7. Around The Ramp there is Brian Spray V5 a frustrating stand up into the end of the ramp. Just round the corner from these is the snatchy Closer V3 which has many people gripped as they meet the final mentally testing top out. From here the problems seem less densely pack and the rock changes ever so slightly. Howling Hound at V7 needs cooler conditions, as whilst the steep start often stays in the shade, you are left slapping the sloper on near red hot sunny rock. Trying to grasp on as the grease ushers you towards the mat makes the problem slightly harder. It’s easier neighbour Ugly Women V3 still has the same sun/shade effect but is less dramatic, so don’t be discourages if you have come here on a sunny day and the conditions are with you. 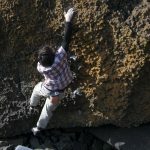 Possible one of the finer problems and contender for the most frustrating problem at Porth Ysgo is Fast Cars V5. A hanging prow, which requires a jump start followed by a determined series of campus moves before you feet are of any use. The issue is that most people start at the western end of the beach and work there way along. Meaning that by now they are starting to get powered out and sadly you are going to need all the power you can get on this problem. Popcorn Party V6 just on from Fast Cars is the other contender for the most frustrating problem at Porth Ysgo for most mortals. Again the order of presentation of the boulders means that having waisted what power and skin you had left on Fast Cars you are now left wanting for both, as these popcorn like blobs of intensely sharp rock only yield to both technqiue, power and the type of tenacity that sore tips just won’t allow. Just remember next time to start from the Eastern end of the beach and work backwards. If you have anything left then the final good problem on this section of beach is Jawbreaker V3, named after the large rounded rocks that make up the landing. This short problem has a devilish start as you try in vain to gain purchase off you feet for the first move for anything longer than a nano second. By now often the heat of the day and the amount of climbing as you run round like a bull in a china shop ticking problems mean that everything aches from the tips of your toes to the tips of your fingers. Meaning every time you stub your toe or fingers grate over another distant edge a little more of your resolve is chipped away. You might be wishing your day is over but further east is a lone boulder it looks miles away and that is a mixed blessing. First off you can get those approach shoes back on and rest up as you walk over to it. Because go there you must, for on this boulder is one of the finest problems here, Made in Heaven V4. This has a very technical starting move to gain the wider crack which is jammed to the top of the high block. Only then will you have done the full tour, a gruelling day of hard bouldering. A weary walk back to the car and slow drive back to the mountains will let you know how the day has gone. The rock will have bitten you hard and etched away at your skin and flesh. In doing so it seeps into your bones. A single beer will knock your head off and submerging yourself in a well deserves bath or shower at the end of the day brings the feeling of a second round of a death by a thousands cuts but everyone is a memory of the immense day you have had in the seaside paradise of Porth Ysgo. You might not know when but you will be back here to close some deals and trade up on others, i can almost guarantee it. Another view of the Incredible Shaking Man. I’d love to quote a couple of paras from your Ysgo piece in an article I’m writing. 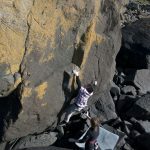 I’m not a climber but it’s about Ysgo and I plan to mention the climbing/bouldering possibilities along with a wider article. I’d happily name-check you.Please email to advise?